Stitch a cozy spot for Rover to rest in a combination of muted plaids and solid flannels. 1. Photocopy patterns as indicated and cut out. 2. From plaid: Cut two 3" x 39" (7.6cm x 99cm) sides. Cut one 18" x 22" (45.7cm x 55.9cm) bottom. Cut two triangular pieces exactly the same with pattern face up. 3. From contrast plaid: Cut two triangular pieces exactly the same with pattern face down. Cut one 7" x 12" (17.8cm x 30.5cm) piece of fabric for appliqué. 4. From solid fabric: Cut two triangular pieces exactly the same with pattern face up. 5. From contrast solid fabric: Cut two triangular pieces exactly the same with pattern face down. Cut four bias strips 1-1/2"(3.8cm) wide. 1. Stitch one plaid triangular piece to one solid piece to form rectangle. Repeat, using same solid and plaid. 2. 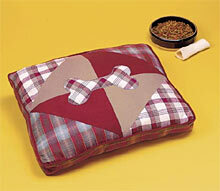 Sew two rectangles using contrasting solid and contrasting plaid. Stitch four rectangles together as pictured, with solids in center. 3. Trace bone pattern onto paper side of fusible webbing. Place fusible side down on wrong side of plaid fabric and press, following manufacturer's instructions. 4. Cut out appliqué; remove paper backing and press on pieced top in center. Place interfacing remnant on wrong side of fabric under appliqué. 5. Stitch through all layers using straight or zigzag stitch. Cut small opening in interfacing and stuff lightly. Stitch bias strips together; press seams open. 6. Fold bias over cording to cover; stitch next to cord using zipper foot to make piping. Stitch covered piping around top edge, overlapping at ends. For sides, stitch two plaid pieces together to form a circle 3" (7.6cm) high by 76" (193cm) in circumference. 7. Fold circle for sides into four equal sections and notch at top and bottom. Pin side to top over piping, matching notches to points of triangles on top sections; stitch. Fold bottom in half lengthwise, notching both ends of fold. Fold in half widthwise, notching both ends of fold. 8. Pin side to bottom, matching notches on side to notches on bottom; stitch. Leave a 4" (10.2cm) opening to turn and stuff. Turn to right side; stuff with fiberfill.